Join the Knitting in Early Modern Europe Project! Here’s an excerpt from “Finding a Fitting Fleece for Fulling: The Knitting in Early Modern Europe Project” by Jane Malcolm-Davies that will run in PieceWork’s Fall 2018 issue, including the instructions for you to knit and full “swircles” for the project. Knitting history has always been the little sister of textile research. But an innovative project led by the Centre for Textile Research in Copenhagen is asking knitters for help, including digging deep into their stashes of yarn to put that right. Knitting in Early Modern Europe (KEME) is a European Union sponsored project with the aim of expanding knowledge of the origins and development of knitting from 1450 to 1750. A systematic and scientific way of examining the evidence for exploring knitting from that period is under discussion, and an experimental archaeology project is seeking suitable fleece for fulling knitted fabric in order to reconstruct the headwear ordinary people wore during the Renaissance. 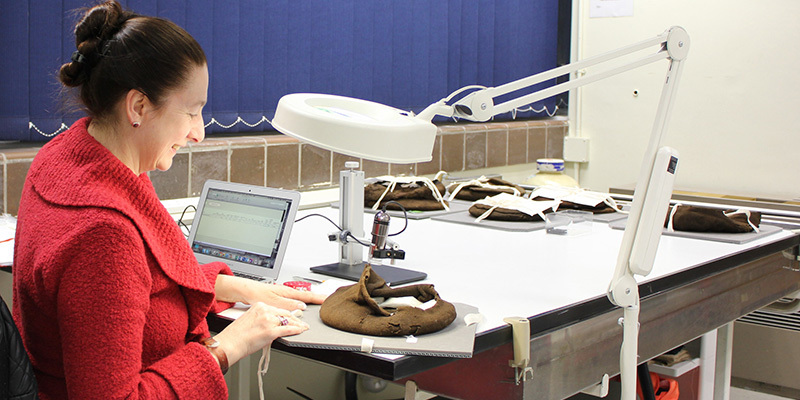 The project has so far focused on knitted caps from the sixteenth century held in museum collections in Europe and North America. KEME has identified more than one hundred of these caps knitted in five main styles, plus separate linings. All but three have been examined in detail, with measurements and photographs documenting specific features. This endeavor has been challenging because there is no agreed-upon convention for recording archaeological or historical knitwork. The nap that provided a mock velvet or faux fur finish to the caps is the focus of KEME’s experimental archaeology. So far, a citizen science team of more than 150 people is signed up to spin and/or knit yarn from a wide range of fleeces to see how they respond to fulling. A series of workshops in the United States and Denmark also turned another 150 volunteers into modern-day fullers, who worked on circular test swatches of knitted fabric known as “swircles.” Fulling was the key to transforming the knitted wool fabric from a fluffy texture to a silky one. The early modern fullers pounded the knitted caps while wet, using their bare hands and feet (if they were workers in the London poor house of 1587, for example) or in water-powered fulling mills with large wooden hammers that beat woven textiles as well as knitted garments. Phase 1 swircles after fulling: (clockwise from top right) Zwartbles Merino (gray), Wensleydale (coral), Black Welsh Mountain, Ryeland (white), Shetland (red). Sign up for the KEME team at www.surveymonkey.co.uk/r/5DFL67G. Choose undyed yarn(s) that have not been treated to prevent felting or shrinking (for example, avoid “superwash” brands). A light-colored fleece is preferable to a dark one to permit dye tests later. Note details such as name, brand, ply, and yarn diameter. Another useful measurement is the yarn count, which is calculated by dividing the length by the weight. Keep a length of at least 5 inches (12.7 cm) in a sealed plastic bag for future data. Knit a set of four swircles. 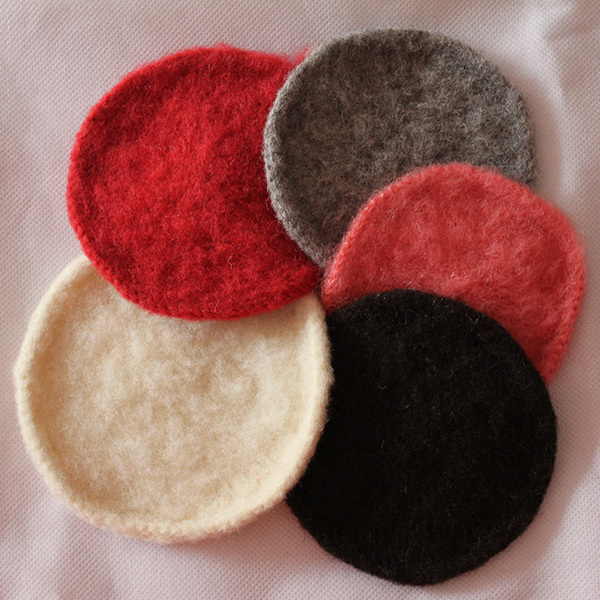 These are circular swatches of tightly-knitted fabric 5 inches (12.7 cm) in diameter. The 5-inch (12.7-cm) diameter is the most important dimension to target. Adjust everything else to achieve this! Use four or five double-pointed knitting needles (pins) or a circular needle. You will need to choose the needle size according to the thickness of your yarn (see below). We used 2.5 mm for our initial experiments for knitting yarn measuring from 5 mm to 2.5 mm in diameter (average 3.3 mm). Keep the needles small and adapt your tension/gauge to produce a tightly-knitted fabric. 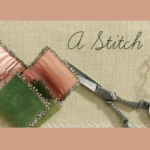 Aim for seven stitches/wales per inch (2.5 cm) and eleven rows/rounds/courses per inch (2.5 cm). This average gauge is calculated from the historical artifacts; it is based on a wide range, so it is a guideline rather than a target. The important priority is that the knitting is tight rather than loose. Use a circular cast-on for eight stitches. You can use any cast-on you like. Knit one round, dividing the stitches equally between four needles. Knit twice into each stitch on the way round (sixteen stitches). Use the cast-on tail to gently draw up the cast-on ring and use it to mark the end of the round by draping it between the needles. Knit plain for this round and all subsequent odd-numbered rounds (that is, Rounds 3, 5, 7, etc.). Set the pattern by imagining the circle divided into eight sections with two sections on each needle. Eight stitches are increased in alternate rows/rounds/courses (that is, the even-numbered ones). However, each increase must not be directly above a recent increase; the location of the stitches that are used for increases (by knitting front and back) must be entirely random. Avoid creating lines, swirls, or patterns of any kind in the knitting. Continue to knit the alternating increase rounds until there are eighty stitches in total (twenty on each needle). If your swircle hasn’t reached 5 inches (12.7 cm) in diameter, keep going until it has. Full two of your swircles. The aim of these experiments is to test a wide variety of yarns to see which comes closest to producing the mock velvet pile remaining in patches on the extant knitted caps. This stage in the process aims not to felt the fibers together but to full them so that they become smooth. The smooth surface makes it possible to raise a vertical nap, which will be the next activity. You will need a bowl, lukewarm water, soap, a wooden mallet, and a board to protect your work surface. A near-to-neutral soap is the best to use but don’t worry if you can’t find any. Just make a note of the brand or any other information that helps to identify the soap. Grate the soap with a cheese grater before adding it to the water. We recommend that you start with very little soap, less than half a handful. You can always add more if you need it. Immerse and soak two of your knitted swircles in the lukewarm soapy water. Using your hands, work the swircles underwater by gently rubbing them together and agitating their surfaces. Put the wet swircles on the board and fold them in different ways, kneading them like dough. Then, beat them with the mallet, refolding them between beatings or use a pair of mallets as fulling hammers. Keep moving the swircles so that they rub together in different directions. Alternate between the three actions for at least an hour. If you have the strength and stamina, you may want to keep going for 90 minutes. Either way, keep a note of how long you full the fabric. 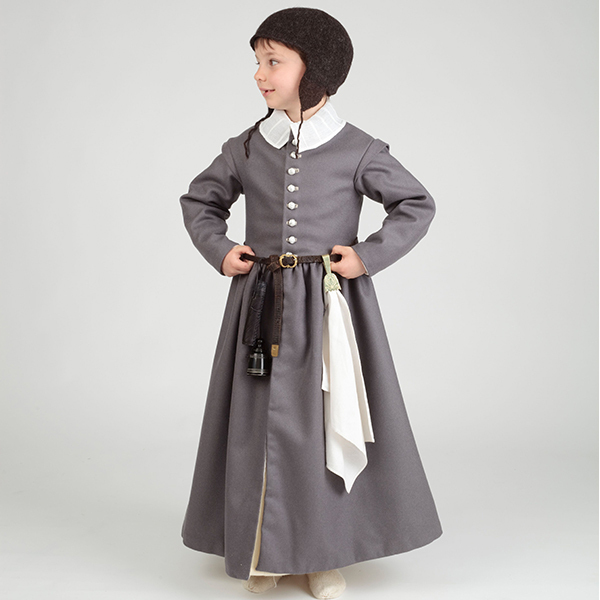 The clothing a Tudor schoolboy would have worn, including a knitted and fulled cap, from The Tudor Child: Clothing and Culture 1485 to 1625 (Nottingham, England: The Tudor Tailor, 2013). Nap your swircles. In the sixteenth century, teasels were used to raise the surface of the knitted fabric, but you can use a vegetable or similar brush, preferably one with real bristles. Avoid using a metal comb (such as a cat comb) because this will break the fibers of the fulled wool. Pick up the fibers in short, swift movements. See how long a nap you can raise by brushing the surface in short, brisk upward movements, literally picking up the fibers vertically. You can try this when the swircle is wet or dry but note which you do and how long it takes. In the past, raising the nap was probably done when the fabric was still damp. The nap on the originals is short because they were shorn to clip the fibers to an even pile. In some cases, the nap has been flattened from long burial, but the best-preserved surfaces are just like the surfaces on new plushy toys. Record your swircles. Please take photographs of your yarn, your swircles (one “before” that is just knitted and one “after” that is fulled and napped). Make sure the labels are visible and legible in the photograph. Finally, take one photograph of all these items together, and, if you have a photograph of yourself in action, please add that. Upload the photographs to an online form at www.surveymonkey.co.uk/r/knitswircles. The form also requests information such as swircle measurements together with the ply of the yarn, whether you knitted it as a single strand or doubled, and the length of time you fulled/napped the swircles. The form offers you opportunities to add your own observations. Dr. Jane Malcolm-Davies is associate professor at the Centre for Textile Research at the University of Copenhagen, where she is director of THREAD (https://innovationsfonden.dk/da/presse/mode-og-tekstilhaandvaerk-skal-integrere-flygtningekvinder), an Innovation Fund Denmark initiative, which is developing a themed model for refugee integration using textiles as the catalyst for change. Jane is co-director of The Tudor Tailor, which publishes resources for the reconstruction of historic clothing. She is currently working on ways to integrate Analytical Tools for Organic Material Studies (ATOMS; www.dkmuseer.dk/sites/default/files/dokumenter/museumtmuseum/ATOMS%20Lecture%20Series.pdf) into textile research. Contact her at jane@tudortailor.com. Jane’s article on this fascinating endeavour, “Finding a Fitting Fleece for Fulling: The Knitting in Early Modern Europe Project,” will be included in the Fall 2018 issue of PieceWork. The digital edition of this issue will be available at www.interweave.com on July 18, 2018, and the print edition will be available on newsstands on July 31, 2018. Plus read more about lace in the current issue, May/June 2018—our 11th-annual Lace issue. On sale now! Featured Image: Knitting in Early Modern Europe (KEME) research leader Jane Malcolm-Davies at the Museum of London with archaeological evidence for knitting in the early modern era.